When police chief Alton Gravely and Officer Carothers escalate the feud between "Torreya's finest" and conjure woman Eulalie Jenkins by running her off the road into a north Florida swamp a long way from town, the borrowed pickup truck is salvaged but Eulalie is missing and presumed dead. Her cat Lena survives. 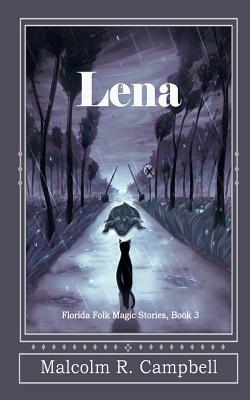 Lena could provide an accurate account of the crime--the tanker truck, the dead man in the trunk of the squad car, and the fire--but the county sheriff is unlikely to interview a pet. Lena doesn't think Eulalie is dead, but the conjure woman's family and friends don't believe her. Eulalie's daughter Aelaide wants to stir things up. The church deacon wants everyone to stay out of sight: he fears reprisals since it's hard to tell the difference between the police, city fathers, and the KKK. Lena teaches Adelaide rudimentary spell work--how to hex the chief of police and how to read the possum bones to find Eulalie's fianc Willie Tate who's working down on the coast and tell him to come home. There's talk of an eye witness, but either Adelaide made that up to worry the police or s/he is too scared to come forward.